Membership applications are only accepted by AIG from individual applicants who must meet all of the requirements of membership pertaining to the grade of membership at which admission is being sought. AIG does not accept company members. a minimum of five years relevant, post graduate professional experience that includes a minimum of three years where the applicant has been in a position requiring regular and routine exercise of professional judgement and discretion. a signed statement that the applicant agrees to abide by AIG’s Code of Ethics (this is incorporated into the membership application form). All applications are assessed by the Membership Committee which is a Permanent Committee of the AIG Council. The membership committee undertakes a range of rigorous checks that may include verification of the authenticity of academic qualifications; assessing the equivalence of overseas qualifications with Australian academic qualifications by reference to Australian Government databases, and interviews with the applicant and members supporting the application. Upon completion of this review, the Membership Committee may recommend acceptance of the application by the AIG Council which is ultimately responsible for the approval of each application. Each application must be approved by a majority of Councillors. There is provision in AIG’s Constitution for Membership to be granted to applicants lacking formal geoscience qualifications where the applicant is able to demonstrate comparable experiential learning and sustained employment in geoscience roles based on their experience. This path to Membership has rarely been used by applicants. Each application of this sort is subject to exhaustive scrutiny by the Membership Committee, involving interviews with both the applicant and sponsors prior to a recommendation as to whether the application should be approved by the AIG Council. This pathway to membership of AIG is expected to be used even less frequently going forward due to the widespread availability of formal geoscience qualifications through study at Australian universities. AIG does not assess or accredit geoscience courses offered by Australian universities. All Universities are required to have all degree programmes independently assessed by both the University Council and Commonwealth educational authorities before a degree can be awarded. This accreditation process is accepted by the Institute as ensuring the quality of geoscience qualifications offered to students in Australia. Most geoscience degree programmes involve a minimum of four years of undergraduate study. Applicants must demonstrate that they have achieved prominence in the geoscience profession and / or made a substantial and sustained contribution to the profession. the application must be approved unanimously by the AIG Council. The applicant’s prominence or contribution to the geoscience profession is assessed by means of a statement detailing how these criteria have been satisfied furnished by the applicant. Applications for admission as a Graduate are received from applicants who meet all of the requirement for admission as Member, apart from required postgraduate experience. Graduates are expected to upgrade to Member, requiring assessment of a new, complete membership application (with the exception of their academic qualifications and transcripts where these are held on file by the Institute) when they attain the required postgraduate experience. Please note that proposers and seconders must have full membership (MAIG or FAIG). Student membership of AIG is available to all full-time and part-time students engaged in undergraduate and full time post-graduate geoscience studies at Australian universities. Student members must confirm their enrolment with a declaration countersigned by their Head of Department annually. Associate membership is available to anyone with an interest in geoscience. Complaints are initially referred to a Complaints Committee that determines the validity of the complaint. The Complaints Committee may recommend measures that must be taken by the member to resolve the complaint. If the complaint cannot be resolved in this manner, it is presented to the Ethics and Standards Committee. 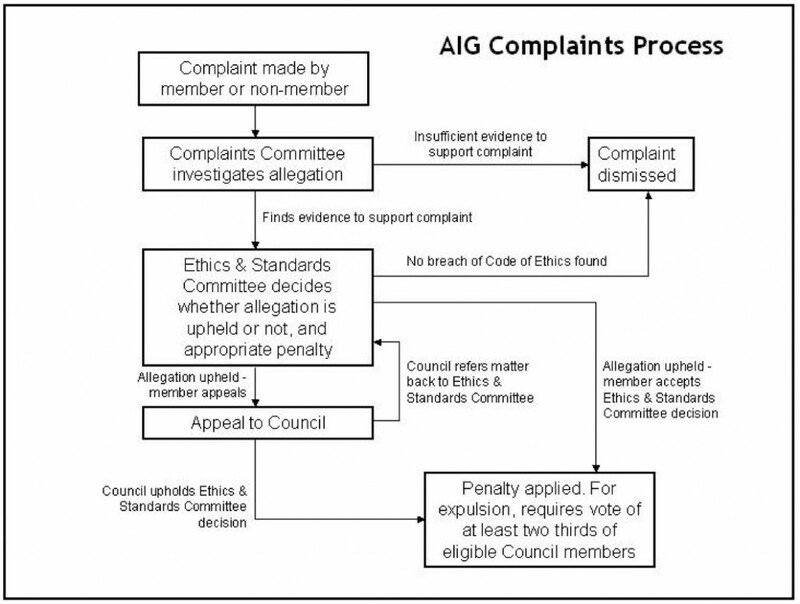 The Ethics and Standards Committee investigates all complaints referred to it and, if the member is found to have a complaint to answer, recommends the action required to address the complaint to the AIG Council. The Council will consider an appeal from the member against the Ethics and Standards Committee finding and recommendations, or take disciplinary action against the member that may extend to suspension of membership or expulsion. The following diagram helps to clarify the process described above. The Complaints Committee has an investigative role, the Ethics and Standards Committee makes findings and decisions in relation to the offence and penalties, and the Council hears appeals against decisions. The Ethics and Standards Committee or the Council will decide in consultation with the respondent and complainant the most suitable form of proceedings. The Complaints Committee is a permanent committee of the AIG Council of up to five members, whose cumulative experience covers reporting of exploration results, valuation of mineral properties, estimates of resources and ore reserves, and broad professional geoscience practice. Only one or two members are required to investigate a particular complaint. Membership of the Ethics and Standards Committee would be drawn from up to five senior members of the AIG, one of whom, ideally, would have some legal or administrative procedure experience. Up to three members would be required to sit on a particular complaint. dismissal of the complaint, if appropriate; • making findings relating to the admissibility of evidence, degree of negligence versus intent to breach one or more of the codes, and appropriate penalty taking into account previous professional history of respondent and early admissions of culpability; and • referring the investigation file back to the Complaints Committee if insufficient information was available to make a finding. Complaints and Ethics and Standards actions are dealt with in strict confidence. Details of adverse Ethics and Standards Committee findings leading to disciplinary action are published for the information of AIG members. Complaints and breaches of AIG’s Code of Ethics are investigated and, if necessary, pursued against a member irrespective of where the basis for the complaint occurred. The Ethics and Standards Committee has wide discretion to decide on one or more penalties fitting the circumstances of each offence. Penalties range from cautions and reprimands for minor offences, through to demotion to a lower membership grade, suspension of membership, naming of members found guilty in an AIG publication, and expulsion from membership in more serious cases. An apology, published, or written or verbal may form part of the penalty.